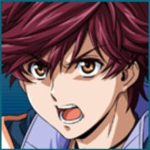 What is Super Robot Wars? 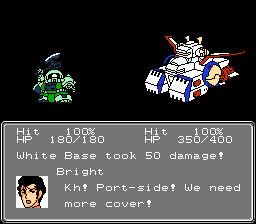 It's a long running tactical RPG series starring anime robots. It's made by Banpresto, a division of Bandai-Namco that does pretty much just this. It's like your thirteen year old self's crazy ramblings about how Mazinger Z and Voltron would totally be awesome fighting evil alongside Gundams and Evangelions and Macross units and stuff, except it's real and just as awesome as you think. What does it play like? - A system of mental abilities that consume a very difficult to replenish resource and give characters things like 100% chance to hit for the next turn, reduced damage for the next incoming attack, circumventing enemies' defensive abilities, getting double xp on the next combat action, and so on. - A system where units build morale over the course of a battle, and you need above a certain amount to use certain attacks. This is designed to emulate the "you can't use your most powerful attack until the end of the episode" shtick in robot anime. - Multiple main characters, multiple paths and multiple endings, and tons of secrets to either get through luck or careful examination of FAQs to trigger hidden flags in the game. - All kinds of ways to modify robots and give pilots new abilities, and to some extent switch pilots around between robots. - Features unique to each source anime, such as power cable connecting/disconnecting from Evangelion, OPEN GET, Trans-Am from Gundam 00, and so on. 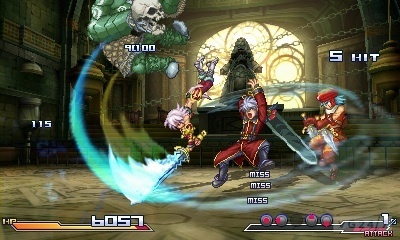 There are six basic parts to the game. 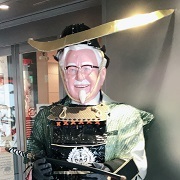 Why won't this ever become a thing outside of Japan? Because the foreign licences for these animes are ancient, unknown, unreachable, and otherwise cost prohibitive for the developer to get at. That, plus all the other reasons why really, really Japanese games often don't leave Japan. Leave your just world hypothesis at the door when you start talking about games like this. Why should I care about this if I don't speak Japanese? Because dedicated individuals (including people inside this thread) have compiled a BIG rear end WIKI dedicated to explaining the ins and outs of the series to English speakers. 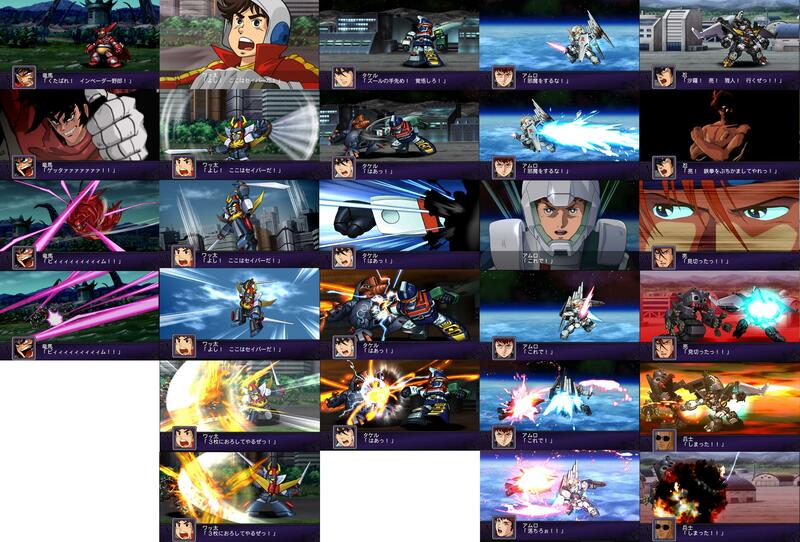 This page is more complete than most Japanese fan pages about SRW, seriously. And, same as Final Fantasy or whatever, once you learn the menu layout and terminology for one game, you've pretty much learned them all. 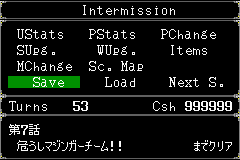 There are also some fan translation projects, but I'll leave it to them to explain the status of them. If I were to buy a game in this series, where should I start? 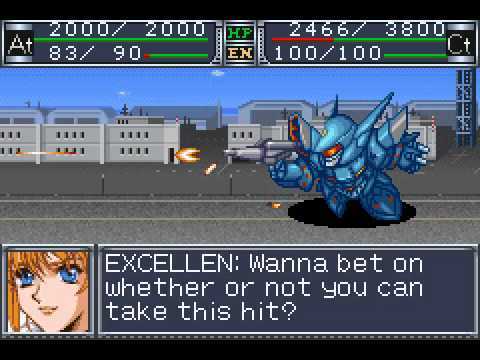 You should probably start with Super Robot Wars Z3: Jigoku-hen, which comes out on April 10th for the PS3 and PS Vita. There is both a disc and same-day download version of both. It is the third game in the Z series, but also the first on the PS3, and thas bunch of animes with high recognition in the West such as Evangelion (the new movie version), Gundam Wing Endless Waltz, and Gunbuster (which has high recognition inside my mind if not in the real world). Most of the screenshots above are from that game. What is the history of this series? 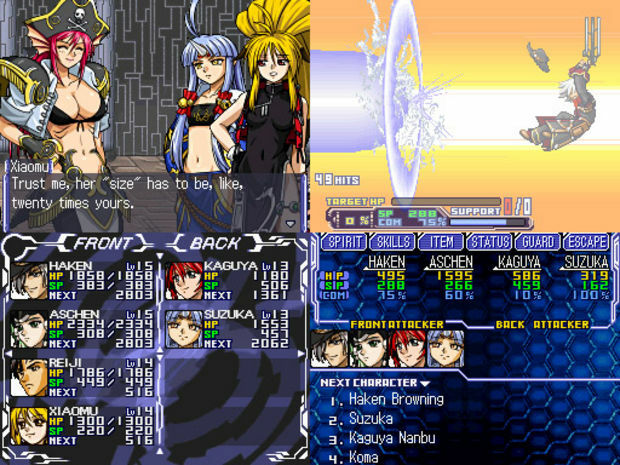 through SRW4 (SNES), and then SRW4 was upgraded/ported to the PS1 and Saturn as SRW Final. 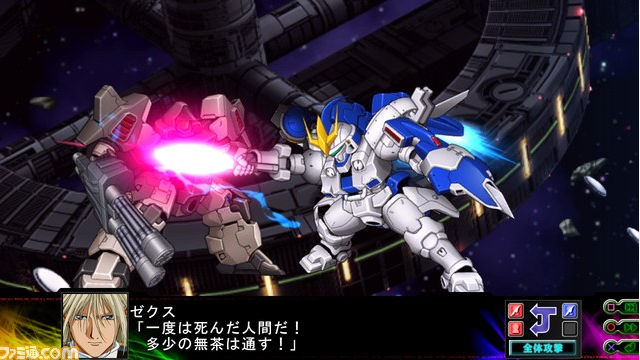 Then, Winkysoft left the series and Banpresto took over, and gave us SRW Alpha, the first of the modern age of SRW games. The universe of Alpha is somewhat a continuation of that of the original series, but also covered a lot of the same things story-wise. The Alpha series proceeded onto the PS2 and finished with Alpha 3, the current grand champion of the series as far as massive scope and happy saving-the-galaxy feelings. The Alpha series closed, Banpresto started the Z series, which is an entirely new world with no connection to the old continuity (that we have seen so far). The first game was on the PS2, and was pretty rad. But then moved to the PSP, and people like me expected a drop in quality at this point, but there was not one in particular. One thing that did change though is that the second game was broken up into two halves, but each one was a full-length game. That appears to be what will happen with Z3 as well. 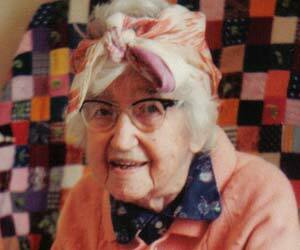 They are usually referred to as Z2-1 and Z2-2, and Z3-1 and eventually Z3-2. So basically the Z series will have five games in it, and the fourth is about to be released. Are there other SRW games besides these? Oh my yes, there are at least fifty non main line, spin-off or otherwise affiliated games on basically every game platform there has ever been (with the exception of the PC). However, most of them are not very good and not worth mentioning. 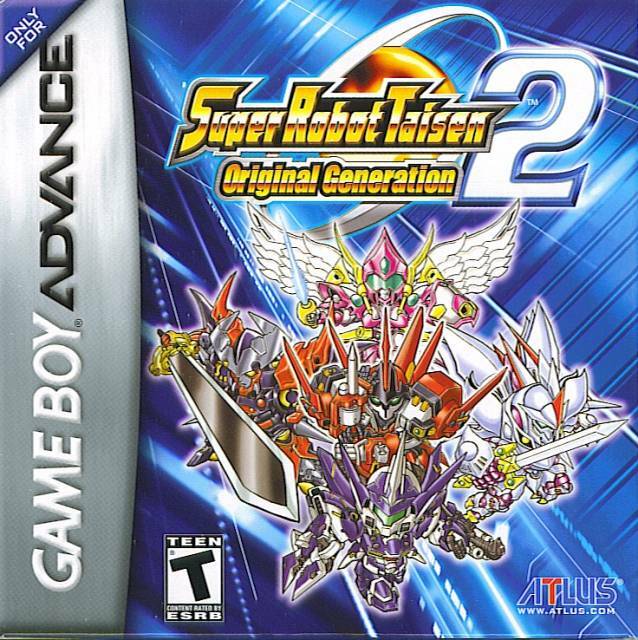 What IS worth mentioning though is the Original Generation (OG) series, which is the only one to have ever found its way outside of Japan, under the name Super Robot Taisen 1 and 2 on the GBA. This is possible because OG has only Banpresto-owned characters and robots, not anime. The most recent game is SRW Original Generations 2 on the PS3. It has some mechanical advantages over the other games, such as the ability to put almost any pilot in almost any robot, and switch weapon systems around between robots. If you were to start playing the series now, this would also be a likely choice. 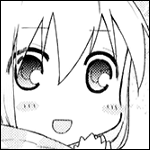 Ironically, I don't even really watch anime anymore; I haven't for several years now. This series delivers me everything I like about anime but in a much more entertaining format. Also, this series usually takes the opportunity to fix glaring plot idiocy in the anime story, making it hard to go back to a reality where Shinji Ikari didn't have Ryoma Nagarae to teach him how to man up. 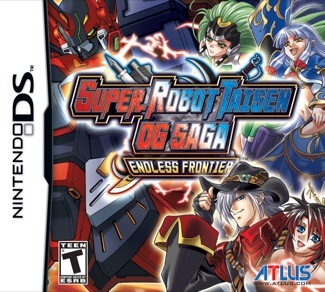 I want to talk about other Japanese robot games in this thread! Hit the gong, everyone! It's time to save the galaxy! 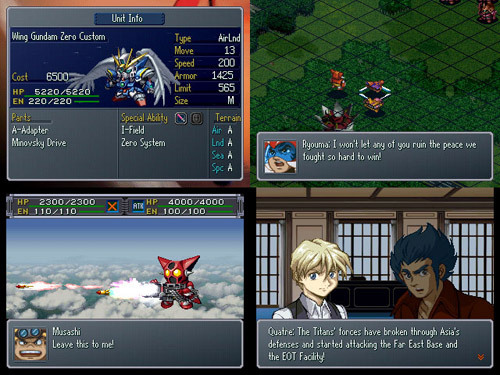 The main SRW series is a mashup of popular anime series, but Banpresto has released several games under the name Original Generation. These games have no licensed content and only use original characters and robots. 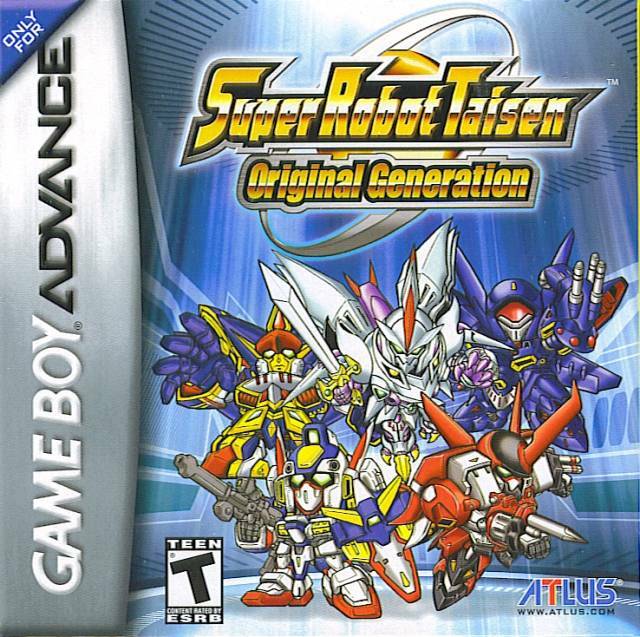 Original Generation 1 and 2 were released for the Gameboy Advance in the early 2000s, and Atlus released them in the US in the mid-2000s under the name "Super Robot Taisen" (don't ask). 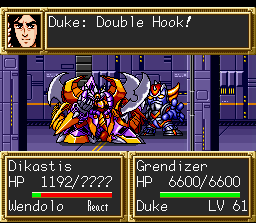 This is a turn-based RPG featuring humanoid characters rather than giant robots, but it's worth mentioning as a spinoff of the Original Generation games. A sequel came out in Japan but never made it to the US. 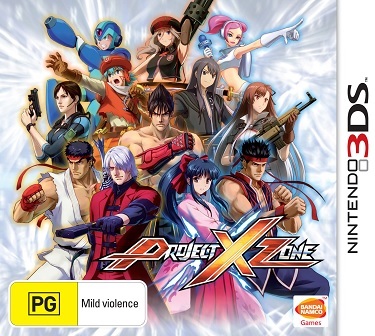 This is a spinoff of a spinoff, which features characters from the Original Generation and Endless Frontier games and uses a turn-based strategy system dating back to Namco X Capcom (its more direct predecessor). Oh, and it has some other official video game properties too, I guess. These are the games that have been translated by fans, for fans. Please don't ask where to find fan-patched games in this thread. Apparently somebody made a patch for "most menus", as well as unit listings, pilot listings, skills, items, and spirits. I would say that the patch itself is probably not worth bothering with, because as Samurai Sanders pointed out, menus between SRW games tend to be very similar. Once you can muddle through one game's menu interface, you can muddle through them all. 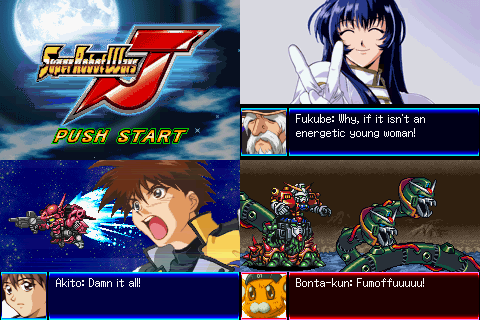 There are other fan translation projects underway for several games, including SRW EX (SNES), SRW 4 (SNES), SRW Alpha (PS1), and SRW GC (GC). Since fan projects tend to have periods of progress and periods of stalling, these can take years to get finished. Just don't hold your breath, and they'll come out eventually. I hope they release an OST for Z3. I also hope they have good music. The soundtrack for Original Generations 2 was more amazing than it had any right to be (just like the game itself). It would be extremely hard for them to screw up the soundtrack on Z3 with their existing precedents. Is RahXephon still in? It's the only robot anime I ever watched. The series list varies wildly from game to game, it isn't really a 'is it still in' thing. Though to answer your question, I don't think Rahxephon has been in a game since its debut in the series. Trying to finish up z so that I can finish og2 on the ps3 so that I can play z3 when it comes out. What a backlog. 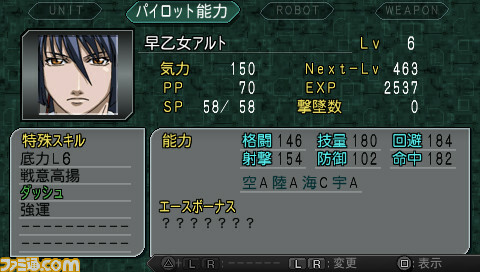 RahXephon has only been in SRW MX for PS2, but it had a solid entry there. MX itself is a really easy game for anyone to pick up and play. 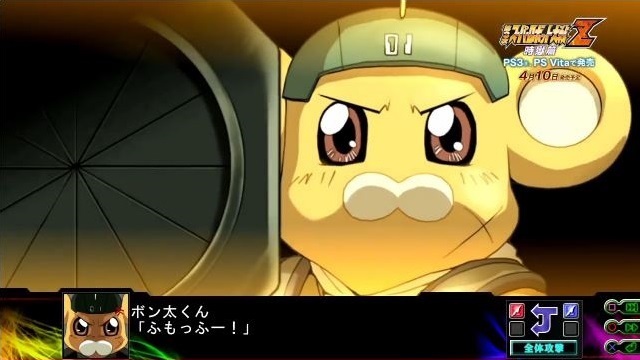 Super Robot Wars: Making your favorite anime better since 1991. Reminder that the power creep in Z3 is going to be ridiculous. 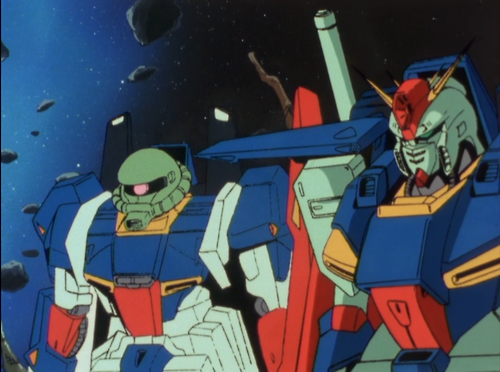 And also, ZZ isn't going to be in Z3 and that's a drat shame. We're missing out on high-quality mobile suits, people! I hope they sell the mass production Bonta-kun version in the bazaar. Edit: And that they let you put anyone in it. Or at least Kurz or Mao. Shut up, I can dream. The first four stages are going to be introduced in Famitsu this week. 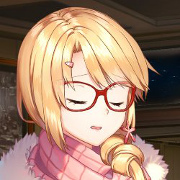 Estelle's blog also leaked the titles and explained that the DLC will work more or less like UX's did. They'll cost 100 ~ 150 Yen each. Is Z3 going to give full body map sprites or just the heads like in Z2? Bleh, seems like a bit of a cut corner considering it's a full console game but that's a minor nitpick on my part. 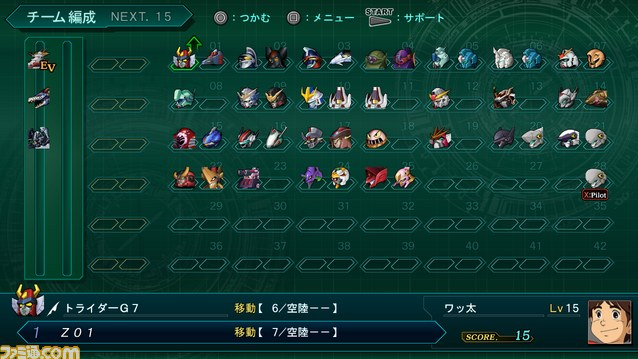 I'm new to playing any of these that aren't translated; how would I go about acquiring Z3 (once it comes out) if I only have an American PS3? Either get a Japanese PSN account (just say you live in Tokyo on your new one) and get a Japanese PSN card online or import it. PS3s are region free so you don't need to worry about that. It's on the Vita too. That might explain it. I did not think of that and it's a good point. The heads just feel a little cheap to me is all. The rest of the game seems so high quality relatively that it feels like an odd choice but if it's on a handheld I can see that. I ordered OG2 from a seller on Amazon that was Prime eligible. If you have Prime, that might be the way to go if you want a physical copy. So I take it that the new PS3/Vita game would be the best jumping on point if I've never played one of these games before (apart from like a translated ROM of one of the SNES ones)? 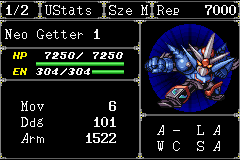 If you don't care about the story, it'll probably be as good a point as any other SRW. I just checked, and none of the Amazon sellers for Z3 have Prime eligibility. It's still a legit option for purchase, but I'm probably going to go the PSN card route just because I prefer less clutter. They usually don't until after release. I've not been able to pre-order with any consistency but after release it's easier to get that way. I can't really do PSN well since I have a launch PS3 with the 60GB HD and it's a pain and a half to cycle things on and off it. 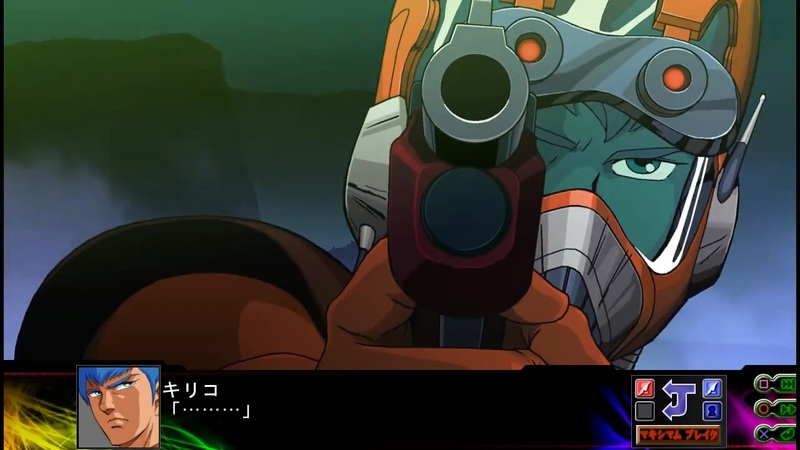 Actually the SNES ones are really inferior to J and Alpha Gaiden, hell the only things 3 can say they have that J doesn't is UC Gundam and Getter Robo. 2 pretty big things to be sure but everything else in the game is so much better that it's not too noticeable. Ah, I worded that weirdly, I meant the only one I'd played before was a SNES ROM, I wasn't really considering going back that far. Man, that is a really boring thread title. If you want a starting point for English games, play J. J has a lot of problems but they won't be nearly as noticeable if it's your first one. If you want a starting point for the series and don't care about language, get SRW Z1 (PS2 Classic for PS3) off the PSN store. It's only 1500 yen and it's one of the best SRWs ever made. 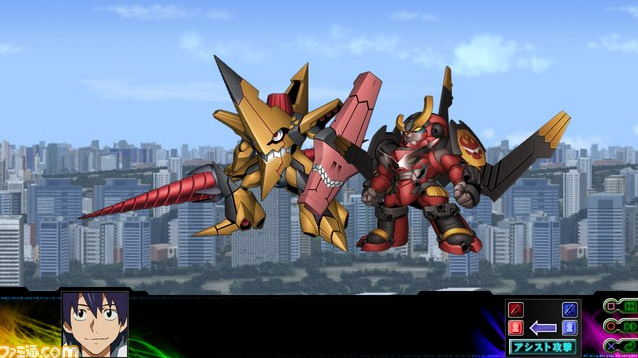 I was too late to suggest "Super Robot Wars 28 Kai Drill Edition ~A Man's Dream is Forever~"
Yeah, I'm playing it again right now and indeed it is. The emulation isn't perfect though, some animations are slightly out of sync with music and sound effects. When Sandman says "Grand Knights, gasshin seyo!" his bizarre arm gesture is at the wrong time. This is serious business. All I got was stupid suggestions for a comedy thread title. But is the maidsparkling on cue? That's really the important part. "Let's be positive! Let's start a fire!" So, I haven't even bothered to play Z2-1 and 2-2 all the way through yet, but I am very tempted in getting Z-3 for some reason. Is this necessarily recommended/can I just get the cliff's notes version of 2-1 and 2-2 somewhere? Z2-1 "cliff notes" can be found here, as a translated Let's Play. What else is a thread title supposed to be . All the good thread titles are comedy ones. Gas this thread and ban op for not understanding Goontiquette. The MP Bonta-kun attack is literally Sosuke asking Heero, Chirico, Rei and Setsuna to put them on and then go wild. 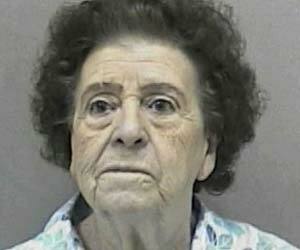 There's other stuff being reported which is hard to confirm. Famitsu has confirmed there is a big thing on the game in their latest issue tho'. Game-wise it appears we're starting with Original, Full Metal Panic, Macross Frontier and Mazinger. I think we caught hints of Neo style spirits a few weeks back if my mind isn't playing tricks on me. 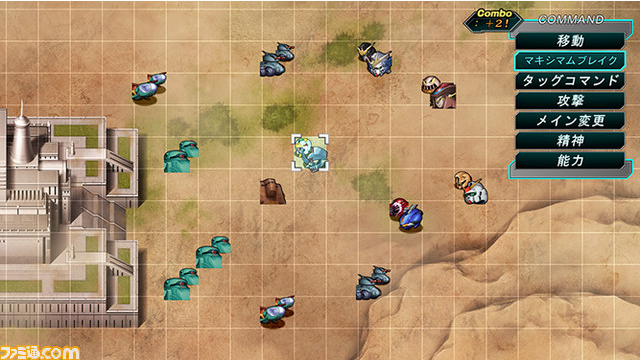 There were spirit commands like Strike+, which we guessed applied the effect to the whole squad. Still good to hear since Neo spirits were cooler. I am surprised to hear we don't have any starting Gundam stuff. I can't think of the last time you haven't had Gundam in the first 4 stages or so. I suppose it makes sense if we're considering them as high-school friends. Maybe they all move in to Ashford at some point? Or maybe they'll be students in that NERV-school! They're all alternate pilots for the Evas.